"The machines are hunting everyone down. Machines programmed to kill." 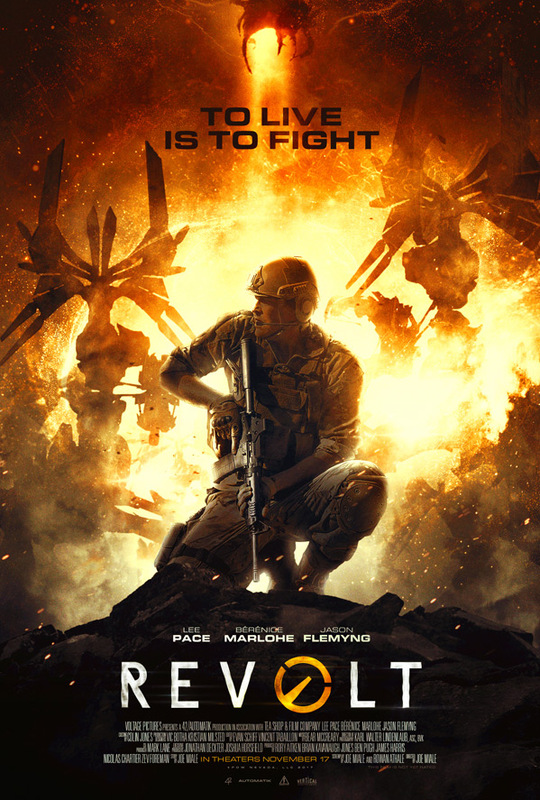 Vertical Entertainment has unveiled a new official US trailer for the sci-fi indie film titled Revolt, from director Joe Miale making his feature debut. The film stars Lee Pace as a US soldier in Africa attempting to fight back against a brutal alien invasion. This kind of seems a bit like a mash-up between District 9 and Transformers, with robot-like alien creatures taking over. Also starring Bérénice Marlohe (who was also in the sci-fi Kill Switch, as well as Skyfall and Song to Song), plus Jason Flemyng, Alan Santini, and Tom Fairfoot. I'm actually very curious about this, might be pretty cool. I dig the machines' designs, different than most other alien designs. You can also still watch the first international trailer for Revolt here, to see even more footage. The story of humankind's last stand against a cataclysmic alien invasion. Set in the war-ravaged African countryside, a U.S. soldier and a French foreign aid worker team up to survive the alien onslaught. Their bond will be tested as they search for refuge across a crumbling world. Revolt is directed by American filmmaker Joe Miale, a former editor making his feature directorial debut after a number of short films previously, including Assassin's Creed: Checkmate and Half-Life: Raise the Bar. The screenplay is written by Joe Miale and Rowan Athale. This project has been in development for years and is just now getting a release. Miale's Revolt will open in select theaters starting November 17th this fall. Who wants to see this?